With Fernando Alonso and Jimmie Johnson set to get behind the wheel of each other’s cars in Bahrain at the end of November, we thought we’d take a look at a few other occasions when worlds collided and F1 drivers handed over their machinery to top names from other championships. With British American Tobacco sponsoring both Jordan and Subaru, Colin McRae and Martin Brundle did swapsies for a day at Silverstone in 1996. McRae seriously impressed in the F1 car and Brundle enjoyed the rally car so much that he actually went on to compete in the RAC Rally at the end of the year. 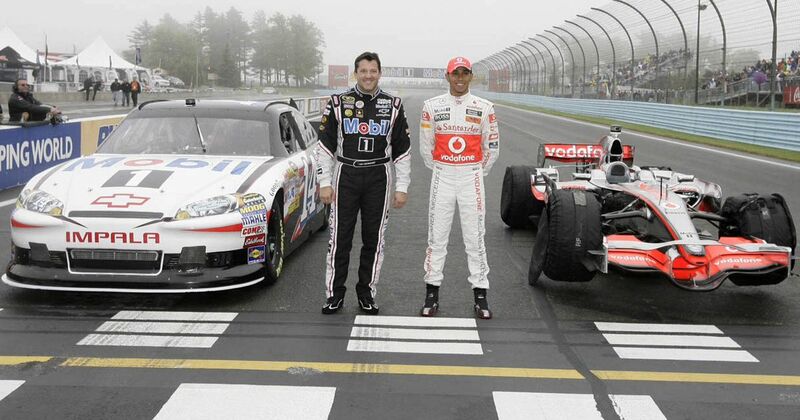 In 2011, a promotion by Mobil 1 saw Lewis Hamilton get behind the wheel of Tony Stewart’s Nascar Cup car and Stewart - who has plenty of open-wheel experience having won the IndyCar championship - in the 2008 McLaren MP4-23. Even better was the fact it took place at Watkins Glen, making it the first time in 31 years a (reasonably) modern F1 car had driven the circuit. Hamilton joked at the time that he’d consider switching to Nascar - although given that he was in the middle of what was probably his worst F1 season, that’s hardly surprising! 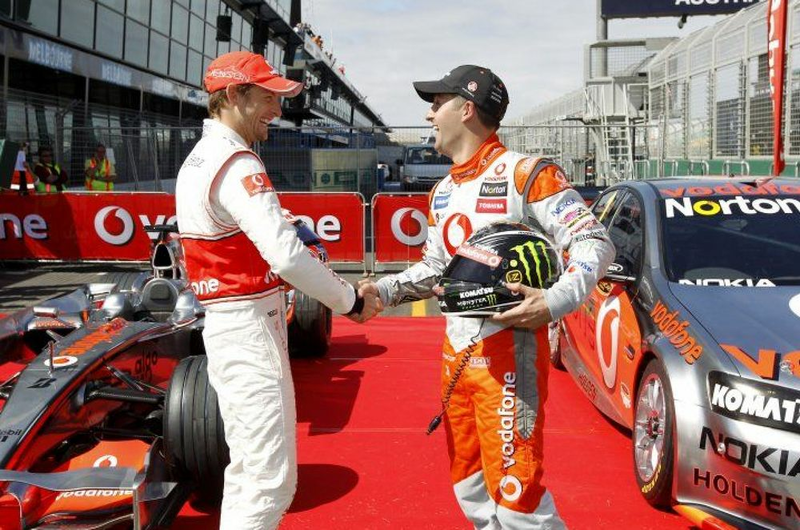 With V8 Supercars supporting the Australian GP in Albert Park, in 2010 Jenson Button and Jamie Whincup - both reigning champions at the time - swapped cars in the build-up to the event thanks to common sponsors Vodafone. A year later, Button was back swapping seats with a V8 Supercar driver, this time Craig Lowndes. Oh yeah, and it was at the incredible Mount Panorama circuit. Both had a go in each other’s car around the legendary track and while Button grabbed the headlines with an unofficial Bathurst lap record, Lowndes was apparently just one second slower. In 2003, Montoya and Gordon swapped seats for a few demonstration laps of the Indianapolis road course. Four-time Nascar champion Gordon called the F1 car “unreal” and complained of a sore neck after just a few laps, while Montoya - who’d just won the Monaco GP - enjoyed how much the stock car moved around. It obviously made quite an impression - less than four years later, he’d switched to Nascar full time. This little switcharoo was organised to promote the return of the Austrian Grand Prix in 2014 - OK, so they’re both F1 cars, but Vettel and Berger having a go in each other’s cars was too cool not to include. Also, so much changed in the 24 years between the Ferrari F1/87/88C and Red Bull RB8 that they might as well be different disciplines. Yes, it is weird to see the 1997 Williams in the red Winfield livery and yes, it is equipped with grooved tyres. At Catalunya in 1998, reigning 500cc motorcycle champion Mick Doohan and reigning WRC champion Tommi Makinen had a go in reigning F1 champion Jacques Villeneuve’s car. How cool is that!? Despite Villeneuve’s tuition, both Doohan and Makinen ended up spinning before they’d even completed a lap. Both went out again - Doohan kept things straight this time, but Makinen spun into in the wall at high speed. And how did Villeneuve get on in the Mitsubishi Evo rally car and Honda NSR500? Well, although he was apparently incredibly keen to try out both, Williams wouldn’t let him on safety grounds, much to the Canadian’s annoyance.